When you are in listening distance of people talking about Jesus or the Gospel message, do you become inquisitive? Perhaps you are somehow undeniably drawn to the presence of the Holy Spirit and you are led to heart of the conversation. A similar experience occurred when a sinful woman entered a room where Jesus was a dinner guest. While it may have been interesting to know that Jesus was dining with a Pharisee, what’s more interesting is that a woman who has been sinning all her life suddenly wanted to see Jesus. “When a woman who had lived a sinful life in that town learned that Jesus was eating at the Pharisee’s house, she brought an alabaster jar of perfume and as she stood behind him at His feet weeping, she began to wet His feet with her tears. Then she wiped them with her hair, kissed them and poured perfume on them” (Luke 7:37-38 NIV). The Pharisee wondered and waited to see how Jesus would react to the surprised visit. The Pharisee, in his own mind, was testing Jesus’ credibility as a prophet. So he waited for a response from Jesus to see if he really knew that this woman was a sinner. Jesus responded with a challenge. In comparing the woman’s behavior to that of the Pharisee, Jesus was quick to point out that the woman’s love and actions were far greater than that of the Pharisee. “Do you see this woman? I came into your house. You did not give me any water for my feet, but she wet my feet with her tears and wiped them with her hair. You did not give me a kiss, but this woman, from the time I entered, has not stopped kissing my feet. You did not put oil on my head, but she has poured perfume on my feet” (Luke 7:44-46 NIV). The Pharisee was hospitable in inviting Jesus to dinner, and it very well may have been a three-course meal, but the sinful woman did so much more. She gave herself to Him. She brought the best perfume, she wept in repentance, and she met the Savior. She must have heard that Jesus could offer something better than living a deliberate sinful life. She must have been tired of living a sinful life. Her mind was made up. “I am going to change my bad habits,” she may have said. 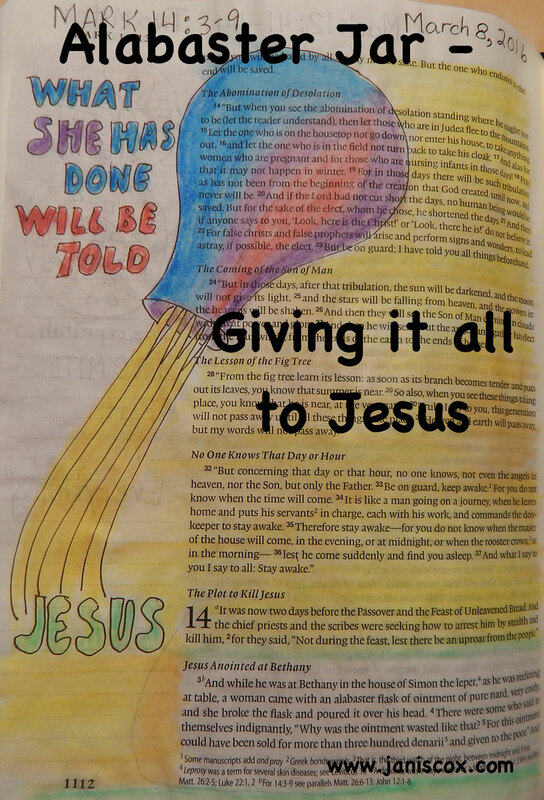 “I want to know what this Jesus can do for me,” she may have determined. She may have been prepared to repent of her sins but was she prepared to enter into the presence of the almighty and loving God? So much that the encounter resulted in tears in place of words? Jesus didn’t have to wait to be told by the Pharisee what kind of life this woman was living. The master knew her yearning heart. The Lord’s forgiveness and everlasting love was hers without question! What was the prayer? The unspoken moan and sorrow and act of repentance. What was the purpose? To seek Jesus wholeheartedly. There was no turning back! 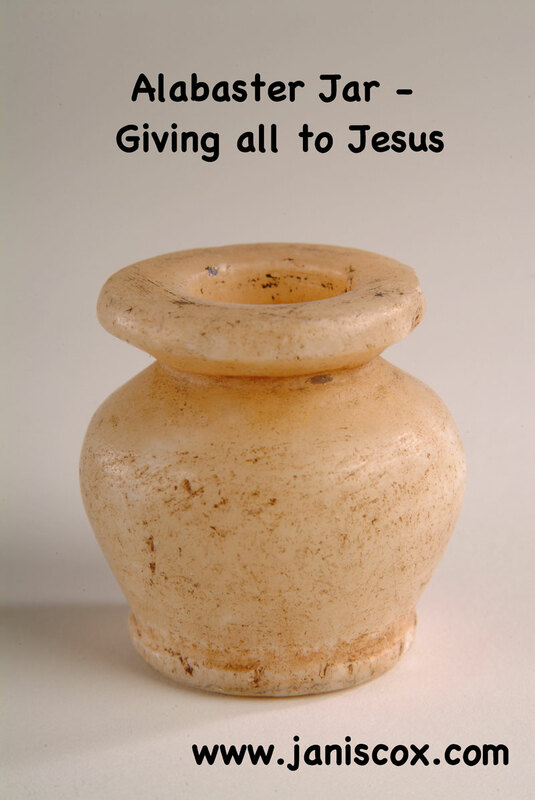 This entry was posted in Prayer and tagged alabaster jar, forgiveness, Janice Keats, prayer, purpose, worship on April 27, 2011 by JanisCox.